Crags and sport climbs. 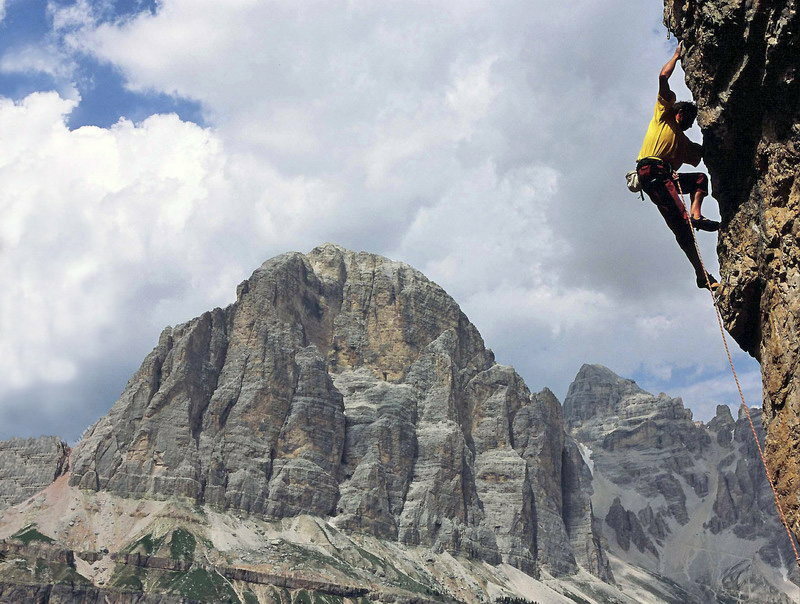 The climbing areas of the Dolomites. 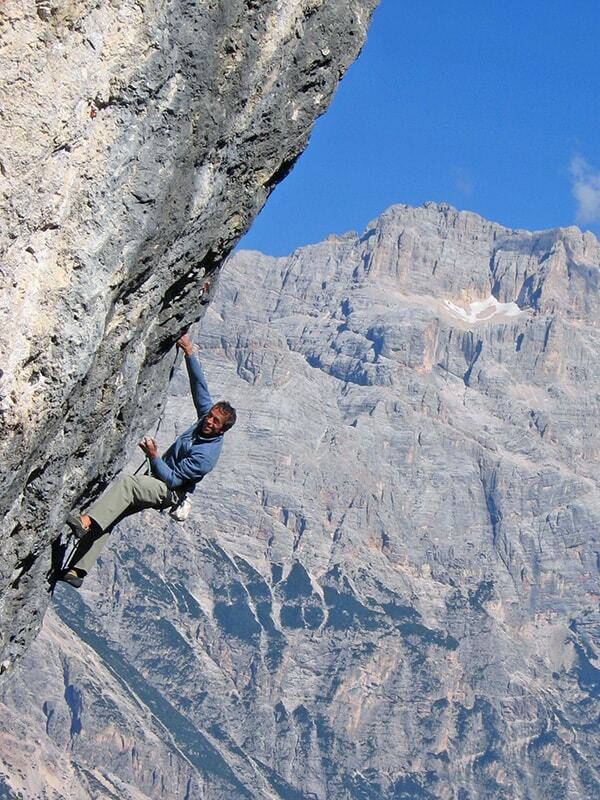 Listing all of the crags in the Dolomites would be an inconceivable task. Hence in this page I limit myself to mentioning the most important crags in the area where I live. 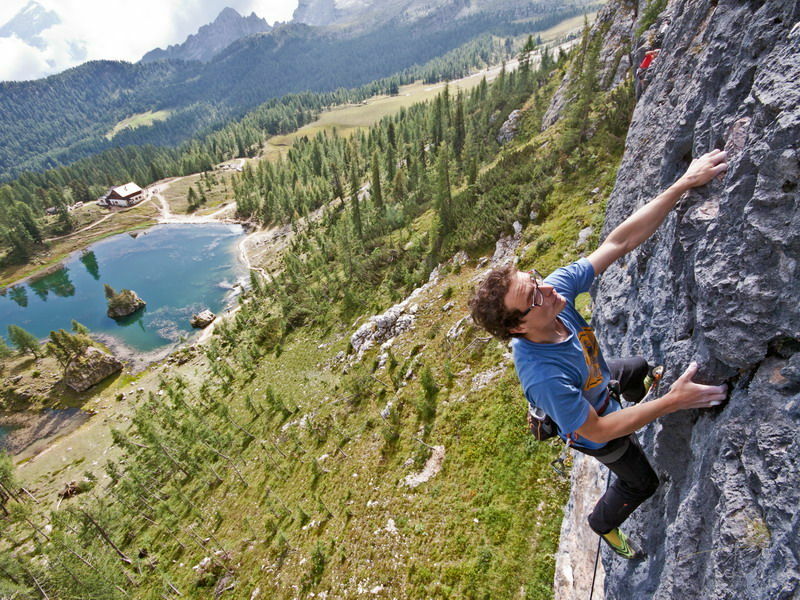 Cortina d’Ampezzo is a true paradise for climbers, not just for the classic climbers looking for reaching the beautiful Dolomite peaks: sport climbers will also find in the Ampezzo valley a fantastic place to play, with the added value of the natural beauty of the locations of the numerous crags in this area. A lot of rock to hang on to, since there are almost 2,000 routes! There is really something for everyone! From the smooth slabs at Son Pouses to the overhangs of Becco d’Ajal, from the short and intense pitches at Sasso dei Finanzieri to the long and sustained pitches at Rio Gere and Setsas. 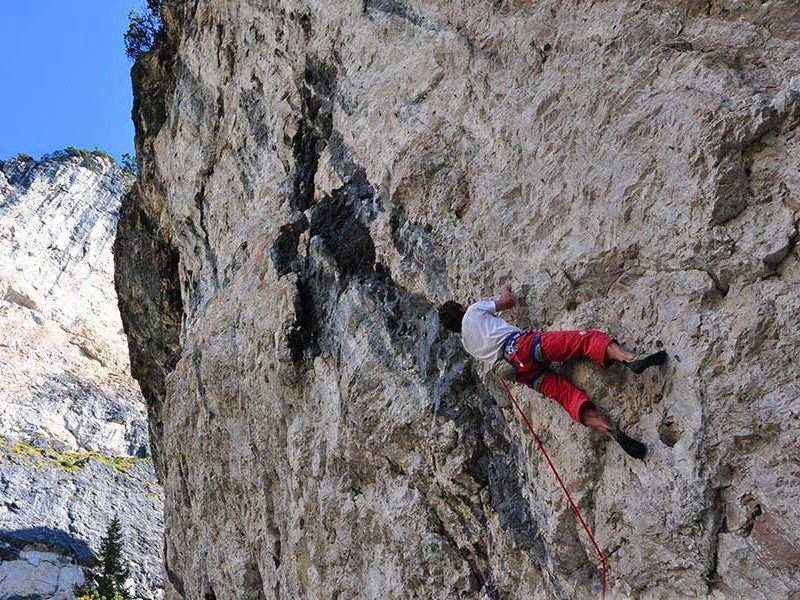 Regarding indoor climbing, in June 2018 a wonderful climbing gym was opened in Cortina: almost 80 routes with lengths of up to 30 meters. 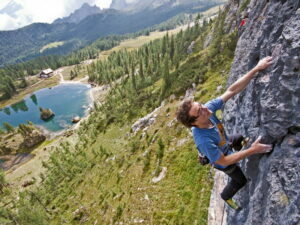 Follow the link to learn more about indoor climbing in Cortina d’Ampezzo. North of Cortina (30 km) there is Nordic Arena of Dobbiaco. 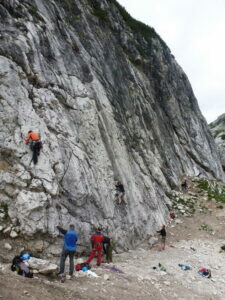 Another nice climbing gym is the Dolomiten Arena in Sesto Pusteria, about 40 km north of Cortina. Lastly the Brunico climbing center, 60 km from Cortina. Please note: within this website you can find out more about sport climbing in Cortina. A new guidebook about the area it was printed in July 2016. 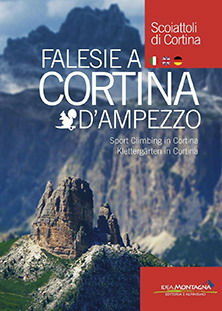 The guide gives the details of 26 sport climbing crags throughout Cortina and the surrounding region. For clarity, the crags have been described in four areas based on their location to Cortina d’Ampezzo and are shown on the overview map. The guidebook is published in three languages: Italian, English and German. The unique Dolomite towers of Cinque Torri. The Crèpo Lòngo, a crag set in a very panoramic setting with an easy approach by Faloria cable car. The sunny limestone slabs of Són Póuses. The overhangs of porous dolomite rock at Crépe de Oucèra. The maze of different shaped boulders immersed in the greenery of the Volpera and Campo caves. The labyrinth of overhanging spires at Bèco d’Ajàl. The block of smooth dolomite rock at Colfiere and Lavagna (the blackboard). The scenic faces of the Lagazuoi and Sass de Stria. The intriguing face of Rio Gere. The sunny crag of San Bodo. The many new crags at Landro. The dolomite crag in the Val Rienza. The aesthetic face of Setsas and Salares. Located at 1800m, the Crépe de Oucèra offers 70 pitches from 6a to 8a+. these are renowned for their beauty, ease of access and orientation, ensuring the crag’s popularity not only in the hot summer months. Despite the fact that the crag is quite old, the bolting is excellent and the distance between the bolts varies, according to the difficulty and characteristics of each individual pitch. From Cortina take the highway SS48 westwards towards passo Falzarego and turn off left at the Pocol junction onto the SS 638 towards Passo Giau. Continue for about 4 km to reach a long straight section and the Alta Via 1 path. Park here and take the rightmost path up to the crag in just 5 minutes. The climbing: the rock is solid with plenty of small weathered pockets and flakes, offering a variety of different climbing styles up the smooth vertical, slightly overhanging and extremely overhanging walls. Best time of year: from April to November. A somewhat easier alternative to the Crépe de Oucèra Alta are the Crépe de Oucèra Bassi, located a few hairpin bends lower down. Immersed in the green forest, the Crépe de Oucèra Bassi offer 80 pitches from 5a to 7c. From Cortina take the highway SS 48 westwards towards passo Falzarego and turn off left at the Pocol junction onto the SS 638 towards Passo Giau. Continue for about 2,8 km to reach a widening to the left wich can be used like a car park; opposite this space ther is a field and the path that take you to the crag. The climbing: climbing is mostly on a vertical wall, but there are also some overhanging pitches. Best time of year: from May to November. This is definitely Cortina’s most important training site. Thanks to their infinite variety of shapes and sizes, the marvellous Cinque Torri ideally represent the entire Dolomites. Although the towers can be admired from the center of Cortina, don’t be deceived by their unmistakable silhouette: the characteristic profile isn’t comprised of just 5 towers, but by a mass of secondary boulders, fractured towers and peaks sprinkled liberally across the entire area. Reach the 5 Torri by car from Cortina via the SS 48 to Cianzopè, on the way to Passo Falzarego. 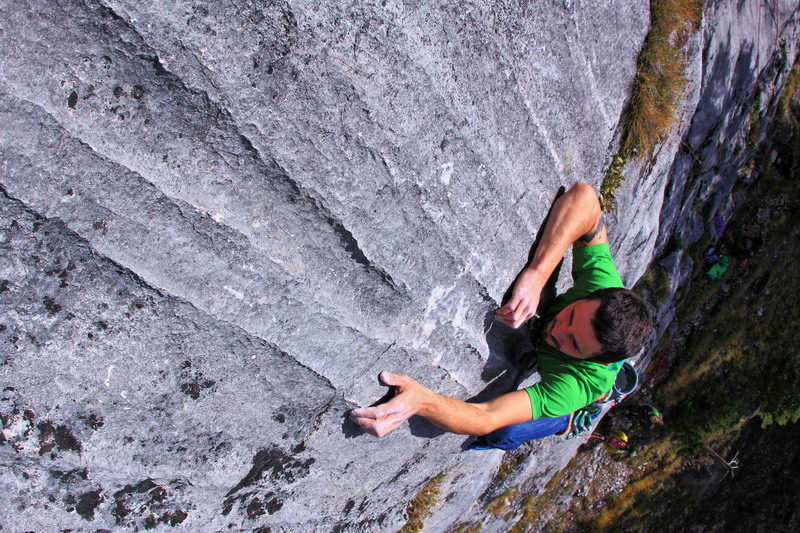 The climbing: principal dolomite reacts in various ways to erosion by the elements depending on the rock face in question; the rock on south-est face is yellowish in colour and overhanging, square in shape with horizontal holds. This rock face dries very quickly and climbing is possible during most of the winter months. The rock on north-west face is grey in coulor and has been eroded by the rain. It is exceptionally solid and has many holes; climbing is only possible during the summer as the rock does not dry very quickly. The climbing techniques vary according to the exposure of the rock faces. Best time of year: from May to November. 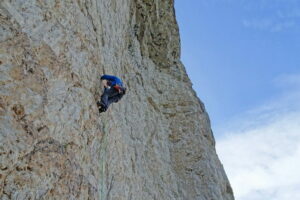 In good weather, winter climbing is possible on south face of Torre Grande. Read my post related to Cinque Torri. The Bèco d’Ajal is a large rocky tower surrounded by a thick fir tree forest at the foot of Croda da Lago; there are more rocky towers, though smaller in size, uphill and to the west of the Bèco. The rock faces of these towers are overhanging and irregulary shaped. As these rocks are situated in the woods and other orographic factors cause low temperatures and sometime dampness, the most suitable period for climbing would appear to be from July to September, but also a few days after the latest rain. Considering the high degree of difficulty of this crag, the bolts are fairly distant frome one other. From Cortina take the highway SS48 westwards towards passo Falzarego and turn off left at the Pocol junction onto the SS638 towards Passo Giau. After approximately 1,5 km you will find a car park to your left, where the road leading to Val di Formin starts. Continue for approximately 150 m and then turn left after crossing the Rio Costeana bridge. After walking on a level path you will start to walk uphill to the right. Following a series of red signs you will pass through the fir tree woods and then you will see some rocks covered in rhododendros and bilberry bushes. After approximately 35 minutes you will get to the base of a large slanting rock with a slanting peak with overhanging rock faces (sector a, b and c). Download GPX – KMZ track file. The climbing: stamina climbing on steep terrain. In the overhanging section the routes are athletic on holes. Best time of year: from July to September. The Croda da Lago crag is located on the south-eastern slopes of Croda da Lago itself, overlooking the magnificent Lago di Federa and its idyllic rifugio. This is one of the most distinctive spots in the Ampezzo region and, thanks to its position, rewards with incredible views of the lake and the sorrounding peaks. The two sectors of the sport crags are located at the base of the large rocky buttress below the featured face of Croda da Lago. As already mentonied, the crag is split into two sectors located close to one another, with a lower and an upper sector. The faces are at around 2100 metres altitude and face south-east. Consequently the crag is best visited in summer, altough sunny spring and autumn mornings can also provide ideal climbing conditionsif the snow level allows. The crag is easily visible from the hut and can be reached with a ten minutes walk, skirting the south side of the lake then ascending the obvious scree slope and the gully just after, following a path right to a ledge with dwarf pines at the base of the face. Rifugio Croda da Lago is accessed from Ponte de Ru Curto (SP638 of Passo Giau) via path 437 to Cason de Formin then path 434 to the rifugio (1h 45′ circa). Best time of year: from June to October. The area is commonly know as “Grotte di Volpèra” (caves of Voplèra) and sees the presence of a numerous boulders. The rocks are situated on the south-estern slope of Pocol in an area stretching from the main road SS 48 to a few hundred meters above the Campo plane. The rock is of the Cassian dolomite kind with numerous holes and scales. All the routes are single pitch, short in lenght and athletic. There are three main sectors in this training site: a) Volpèra alta, b) Volpèra bassa and c) Campo. In order to reach Volpèra alta and Volpèra bassa, you are advised to park 200 meters before the Pocol tunnel, on the main road leading to Passo Falzarego. Follow the signposted downhill path number 429. The best way to reach the Campo sector is through a village called Campo di Sotto; park near Hotel Tiziano (the hotel is closed) and then hike up a path which runs through the village in the opposite direction to that of the road leading to Lake Pianozes. while the technical vertical walls require excellent footwork. The southern rock face of Sòn Pòuses crag is locatedin the vicinity of the narrow passage which closes the dell of Cortina to the north. The rock is a compact limestone which offers vertical slabs. A winter’s strength training is of little use here: technique and excellent footwork are required. From Cortina, follow the SS 51 (Alemagna) towards Dobbiaco. Park the car near the Malga Ra Stua junction (approximately 7 km north of Cortina). It is then necessary to walk towards Malga Ra Stua for 200m and then turn right at the signpost (Palestra di roccia); a rather steep path must be followed and after 20 minutes you will arrive at the foot of the central rock face. 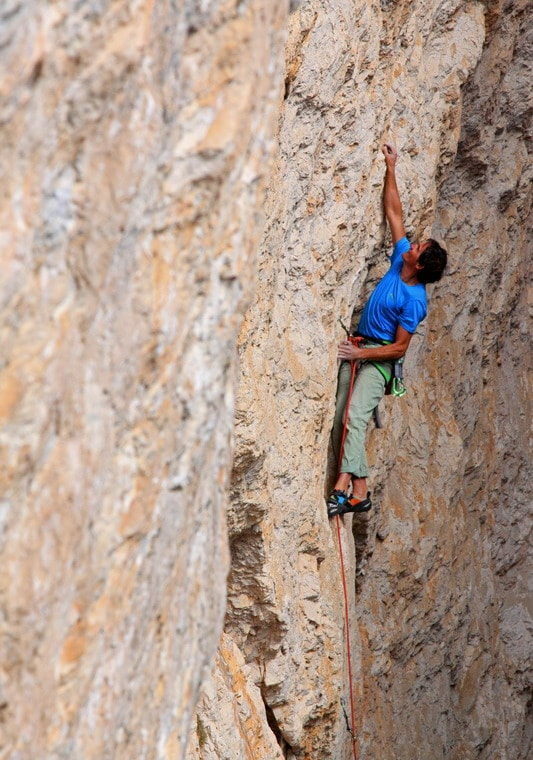 The climbing: Sòn Pòuses distinguishes itself for its highly technical and delicate slab climbing. The Setsas crag takes its name from the highest peak (Setsas 2571 m) of the long south-facing rock face located 2 km west ot Passo Valparola (2200 m). The peak itself is actually located more than 1 km west of the crag and on some maps the spot height above the crag itself is given as Monte Castello (2371 m). The sport climbing site was bolted in 2013. The crag is split into two sectors, the first to the east (Canyon) and the second to the west (Sasso Bianco). The first sector is characterised by long routes, some in excess of 40 metres, developing on yellow end grey rock which is slightly overhanging. In the right part of the sector there is a detached rocky buttress just a few metres from the main face, meaning that the start of the routes in this part of the crag are almost always in the shade and in the spring there can be some residual snow at the base. The second sector, featuring vertical and overhanging routes, develops on a yellow face located a few metres above the path which runs along the base of Setsas. The two sectors faced south and are situated at around 2150 metres. As such they are best climbed in the summer, although on sunny days they can also be climbed in autumn and spring, depending on the snow cover. In terms of the surrounding landscape the crag is located in a fascinating area, boastìng a panoramic viewpoint over the most beautiful mountains in the Dolomites such as Civetta and the Marmolada. From Cortina follow the SS48 delle Dolomiti until reaching Passo Falzarego. From here join onto the SP24 of the Passo Valparola, descending towards San Cassiano. After 2 km park by Rifugio Valparola (there is another large car park by the Fortress de ntra i Sas, 400 metres away). Take path 23 alongside the rifugio (towards Pralongia), passing above Lago di Valparola. This leads quickly to a gully; descend this with a short section of wire then follow the path across the hillside, skirting the southern faces of Setsas. After 1.5 km (around 20 minutes from the rifugio) reach the main sector, located above a steep grassy slope (faint path). The second sector is reached by continuing towards Pralongia for around 300 metres. The climbing: technical stamina climbing, crimps, shallow pockets. Vertical and overhanging walls. There are some very long pitches. Approach: 30 minutes to sector Canyon. 45 minutes to Sasso Bianco sector. Best time of year: from June to October. Summer is the best time. The Sasso di Stria, a minor peak within the Fanis group, is famous for its popular Spigolo Sud, an easy arête clearly visible from the nearby Passo Falzarego. The base of its east face is weathered and slabby and hence ideal for beginners. 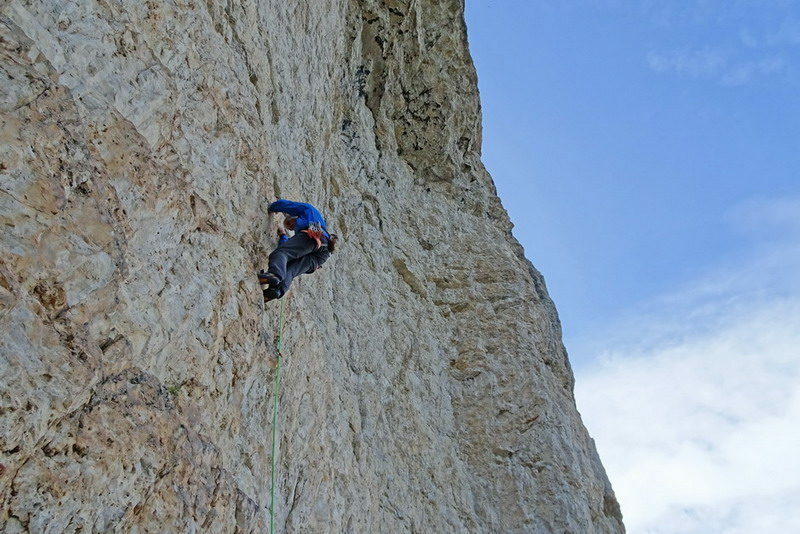 Some routes were equipped long ago for the military “Alpini”, but in 1996 a group of aspiring Mountain Guides bolted the entire wall, thereby creating one of the Dolomites’ easiest crags. Continue towards Passo Valparola to a car park on the left near a large boulder. A path leads downhill to the wall, clearly visible from the road. The climbing: easy angled slab climbing. The wall is on the South Face of the Piccolo Lagazuoi, a peak in the Fanis range, famous for that incredible war fought between the Austro-Hungarian and Italian armies and for its open-air “Great War” museum. To access the crag, park your car at the Falzarego Pass and follow trail number 402, following the signs pointing to the Lagazuoi tunnel (“Galleria del Lagazuoi”), until you reach a fork where the signs indicate the direction for the crag. The climbing: vertical face climbing with plenty of holds. Read my post related to Lagazuoi crag. This crag is located at the base of the west side of Mount Lagazuoi. Given the west-facing aspect, climbing is possible here until late in the afternoon. The rock is predominatly dolomite and is well featured with crimps and side-pulls. The characteristics of the rock mean that the face dries quickly after rain. From Passo Falzarego take the direction of Val Badia (SP24). After the Passo Valparola descend the first hairpins to reach a layby by an old road; park here. The crag can be seen to the north-west. Follow the old road for a few hundreds meters until meeting path 20a (directions Forcella Salars – Rifugio Scotoni) on the right and follow this for ten minutes to reach the base of the crag. 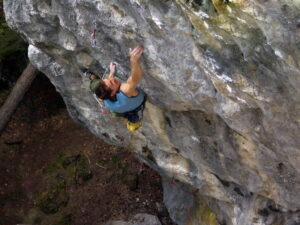 The climbing: technical stamina climbing; crimps, shallow pockets. There are some long, overhanging pitches. This rock face dries very quickly. Best time of year:: from June to October. You can not help noticing the vertical and smooth wall of Sass Dlacia which has a strikingly black and yellow colour, as you drive along the road leading down from the Passo Valparola to Armentarola. At the foot of the rock face you will find a number of large boulder which fell from the upper part of the big wall. This wall and its boulder increases climbing opportunities in this area. The crag may be reached by driving from Cortina to the Passo Falzarego and then to the Passo Valparola; drive on for a few km along the slopes of the Val Badia, as far as you reach the Sass Dlacia camp site, and park here. From the camp site follow the path leading to the wall. 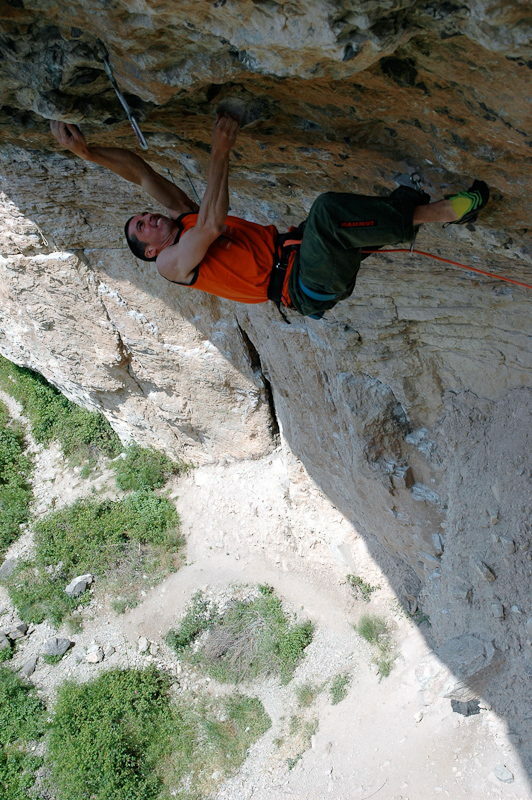 The climbing: in the overhanging section the routes are athletic, while the technical vertical walls require excellent footwork. Best time of year: from May to October. 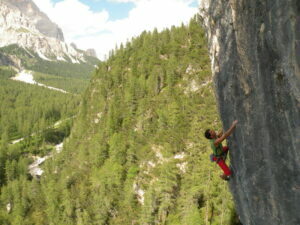 This is Cortina’s newest crag (2009). In truth the first routes were bolted on this enormous outcrop at the start of the ’90’s by Diego Ghedina “Tomasc”, a member of the local “Scoiattoli” group who realised the potential of this crag. Ghedina soon abandoned this project however as he discovered another attractive face: the “Crepe d’ Oucera bassi” which he bolted from start to finish with constant and convinced passion. 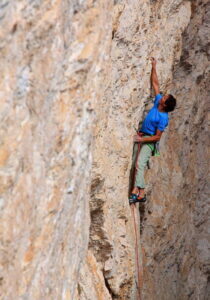 Many years have passed since then but recently two untiring Scoiattoli climbers decided to valorise the crag once more. 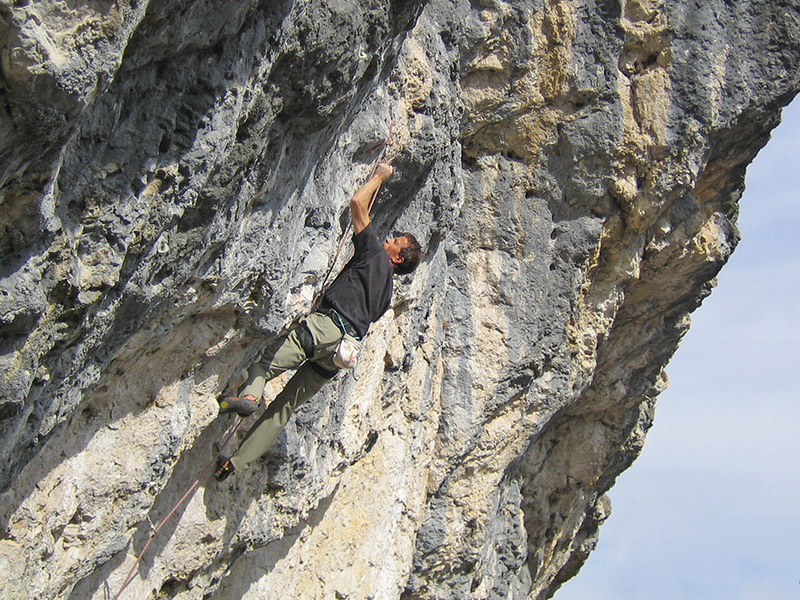 The expert Mox (Massimo Da Pozzo) and Bruno Sartorelli sorted out the original routes and created numerous other, up to 40m long overhanging lines. From Cortina follow signs east for Passo Tre Croci – Misurina. After circa 5 km a road breaks off left for the mountain hut “Brite de Larieto”. Continue along the main road for another hundred meters to reach a small layby on the right – park here. A small path leads right (SE) into the forest of larch trees and on past a river bed and then steeply to the enormous outcrop (15 minutes from the car park). The climbing: stamina climbing on steep terrain. Best time of year: from May to October. Summer is the best time. Something like this had been missing: a crag with lots of easy routes, up excellent quality rock, ideal for those who although they don’t master the hardest difficulties, enjoy climbing for the sake of it, ideally in magnificent surroundings. Tahnks to the tried and tested collaboration between the Cortina Mountain Guides and the Faloria cable car, a new crag was recently equipped above Cortina on the rocky outcrop called Crepo Longo, sul Monte Faloria. 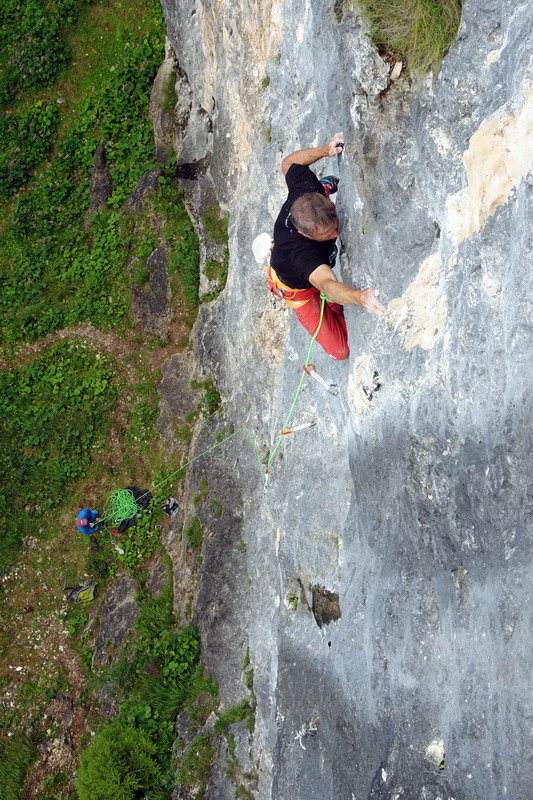 At present the crag hosts 26 pitches up soldi greyish-black rock. Most climbs are in the 6a/6b region, but there are some 5c’s, two grade IV routes and at present just one 6c. The ease of access and south-west orientation combined with the beauty of the routes render Crepo Longo well-worth a visit. The easiest way to get there is definitely by using the Faloria cable car, from the centre of Cortina. At the top descend north-east down the winter piste. Before reaching the start of the chairlift which leads to Tondi di Faloria take the obvious path signposted for the crag. The walk-in takes circa 20 minutes, download the GPS track in the pdf on the right. Alternatively, start from Rio Gere (by the Cristallo and Faloria chairlift), on the road which leads from Cortina to Passo Tre Croci. Park the car and continue on foot along the dirt road (path n.212) which winds its way along the Faloria piste to reach the start of the chairlift which leads up to Tondi. Continue on to quickly reach the crag. This option is obviously far longer, calculate circa 1 hour for the walk-in. The climbing: vertical face climbing with plenty of holds. The harder pitches have some slightly overhanging sections. 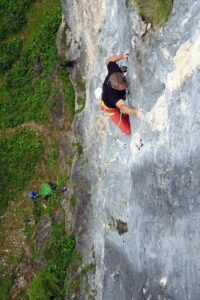 Number of routes: at present the crag hosts 26 pitches up solid greyish-black rock. 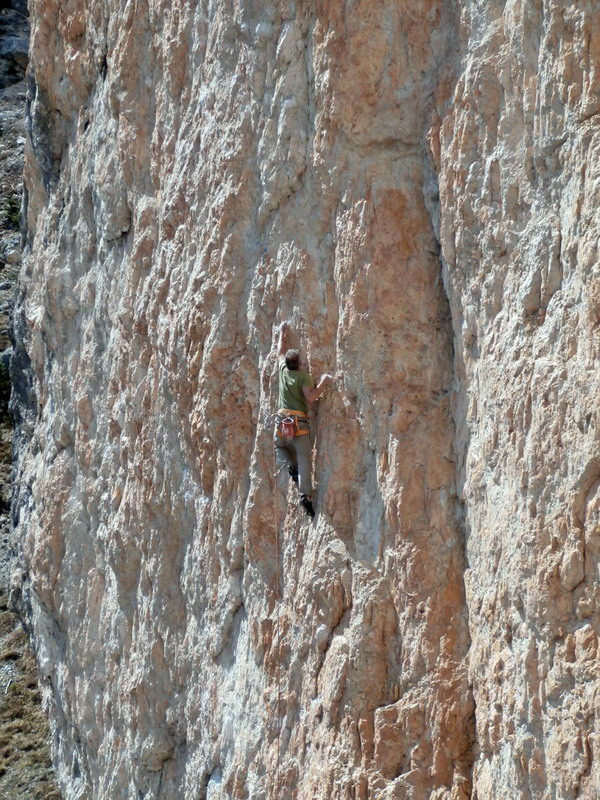 Read my post related to Crepo Longo crag. The crag is located on the eastern slopes of the Geierwand (Col di Specie 2100 m.) to the west of Lago di Landro (Dürrensee). Characterised by yellow rock with sections of black, the wall is situated at around 1675 metres and faces south. From the crag, situated in a particularly scenic spot, there are excellent views of Lago di Landro and Monte Piana just opposite. The climbing routes are somewhat limiting in terms of grade, with many routes above 8a, but there are also a number of easier routes to complete the selection. The yellow walls of the Geierwand have been known to climbers for years tor their superb trad climbing routes on the upper part of the long face. The base of the face is fairly good but children must be supervised carefully due to the tiring approach and the presence of rocky cliffs in the surrounding area. Bar Ristorante Lago di Landro is the nearest support base, located on the shores of the eponymous lake just a few metres from the parking area. From Cortina follow the SS51 delle Dolomiti towards Dobbiaco for around 19 km to reach Lago di Landro (Dürrensee), parking in the clearing on the right (cycleway) by the shores of the lake. Turn back (towards Cortina) and walk along the edge of the road to reach a sign for Lago di Landro (Dürrensee). Here cross the road and join onto a path which ascends steeply into sparse trees to reach a scree gully. After around 30/35 minutes of tiring ascent the yellow and black rock of the crag comes into view on the right. 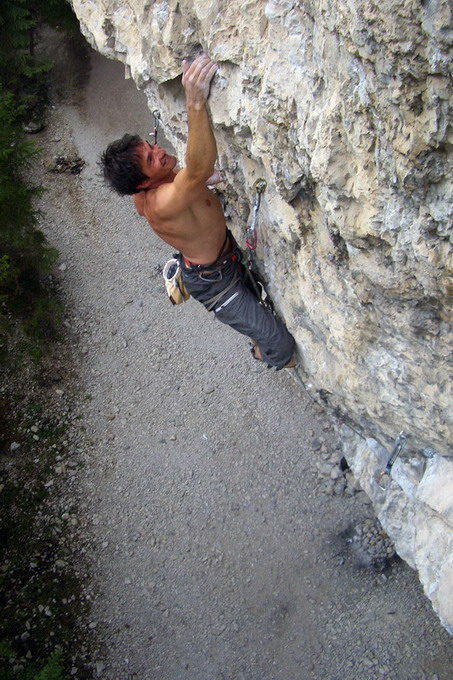 The climbing: The routes are long (around 35 m) and generally require good endurance, although some of the routes also feature intense boulder moves. As mentioned above, the climbs develop on predominantly yellow rock which, thanks to repeated climbing, has become solid and is characterised by small crimps and pockets. The crag of Landro is the most conveniently accessible climbing area of all those presented in this website; it is located just one minute from the parking lot. 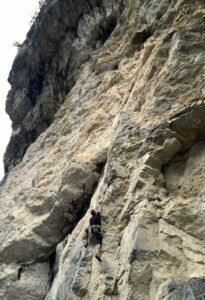 It is possible to climb here in bad weather, since the overhangs offers shelter from the rain. The crag is frequentabile for many months of the year, but in winter temperatures in the Landro Valley are very strict. The crag is divided into two sections: the first has easy slabs and middle grade vertical routes. Higher up to the left lies the second section, and there prevail overhanging routes, not too continuous, but sometimes with difficult passages. Take the main road Alemagna (SS 51) from Cortina, drive over the Passo Cimabanche and past the turn-off for Carbonin to Misurina. Less than one km after this fork the road passes benath some overhangs. Park the car on the right. A path leads from here to the crag, just 50 m away. Continue up leftwards for 5 minutes to reach the upper sector. The climbing: some easy angled slab climbing, in the overhanging section the routes are athletic and bouldery. Best time of year: from April to October. Like Landro’s crag, also this crag is situated just one minute from the parking lot and it is possible to climb here in bad weather, since the overhangs offers shelter from the rain. Take the main road Alemagna (SS 51) from Cortina, drive over the Passo Cimabanche and past the Lake of Landro. After 500 m you will reach the Hotel Drei Zinnen. Park the car here: just behind the Hotel you will see the crag. The climbing: steeply overhanging powerful routes. The tiring approach is definitely worth it: the atmosfere is superb, right in front ofthe north faces of the Tre Cime di Lavaredo, and the rock is great. The grey vertical section has big pockets, whereas the yellow section has sharp edges. Take the main road Alemagna (SS 51) from Cortina, drive over the Passo Cimabanche and past the Lake of Landro. After 500 m you will reach the Hotel Drei Zinnen. Park the car here. From here walk easwards along the dirt road (number 10 and 102) which crosses a flat section and leads to the river in the Val Rienza. The road now steepens and, following the river, leads past a rocky wall to a plateau; the Valle di Rinbianco comes into view to the left after a further 20 minutes. A sign on a boulder indicates a steep path to the left; follow this for 10 minutes through a pine forest to the base of the wall. The climbing: technical stamina climbing; crimps, shallow pockets, holes. San Bodo is situated at an altitude ranging from 1300 m to 1370 m and has mostly south-estern exposure: these characteristics makes San Bodo an exellent site for climbing in the spring and autumn months. It is advisable to avoid the warmer periods in summer. When driving from Cortina towards Belluno, after 10 km you will arrive in Chiapuzza; after a series of straight roads you may park outside the Cima Belprà and Cantore Hotels. There is also parking for 6-7 cars on the side of the road by the old tool booth. From here ascend to the tool booth of the old railway to reach the sign for San Bodo. Walk up a steep path through the woods for approximately 15 minutes until you get to the crag. 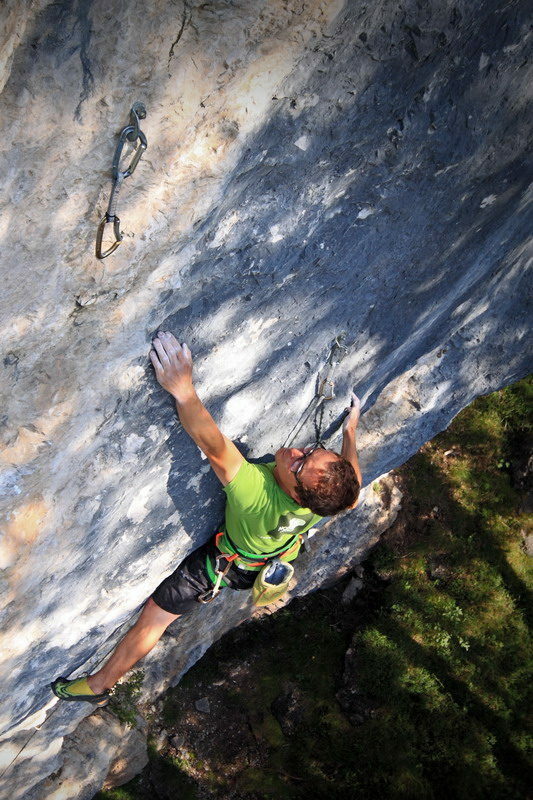 The climbing: technical vertical walls that require excellent footwork. This crag is not located in Cortina, but it has historical significance in that it marked the evolution of climbing in the larger area of Northern Veneto (to which Cortina belongs). 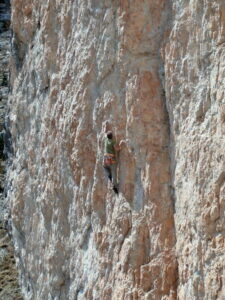 Though there is a “no big deal” section, Erto is famous for its large number of difficult routes. In addition, large overhanging rocks protect climbers in case of heavy rains. Though long use has made some of the routes a bit slippery, the crag much deserves a visit. From Cortina, to reach Erto you take State road 51 (“Alemagna”) southbound. Once in the town of Longarone (49 kilometers, about 30 miles from Cortina), take state road 251, following the signs to the Vajont dam. Right after the dam, to the left the crag is immediately evident. The trip is about 50 minutes from Cortina. Best time of year: all the year. Not in the coldest days of winter.